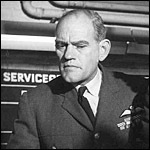 Harry Andrews (born in Tonbridge on 10 November 1911) was a strong-jawed, imposing character player of myriad British films from 1953 until his death, latterly more often in TV, and also in demand for international films. He was on stage from 1933, and after army service reappeared at the Old Vic, and his stage career, much of it in the classics, continued unabated as his film work gathered momentum. He played a wide range of roles with a fair smattering of military types, including the avuncular sergeant in Ice Cold in Alex (d. J.Lee Thompson, 1958), the ruthless RSM in The Hill (d. Sidney Lumet, 1965), and the brigadier in Play Dirty (d. André de Toth, 1968). But he was also at home in comedy, playing the likes of Beryl Reid 's gay brother in Entertaining Mr Sloane (d. Douglas Hickox, 1969) or the dotty 13th Earl of Gurney in The Ruling Class (d. Peter Medak, 1971), and slyly undermining the robust, utterly reliable persona honed in so many films. He was awarded a CBE in 1966.